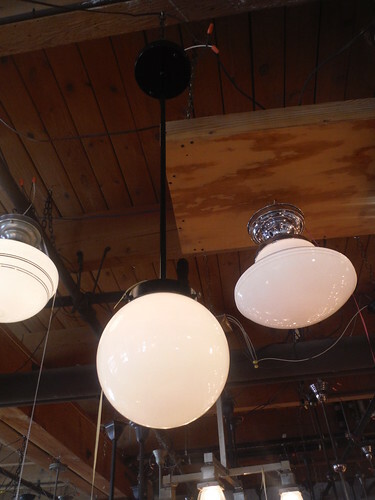 Bare bulbs in basic ceiling fixtures provide harsh and inadequate light for the Wendy loft. At the moment. 6 months after moving in I’ve gotten around to ordering lighting fixtures from ‘Lightworks‘ an awesome little family company that renovates old fixtures, designs and makes new fixtures and just loves lighting. I’ve spent several visits just sat on a bar stool in the shop talking to Charles and Kathryn while Wes walks through and the new puppy tries to get into the showroom. They are lovely people. I’ve bought some plain pendants with 18 inch hand blown glass globules ‘shades’ that will cover two bulbs. The photograph is of the shop demo with an 8 inch globe. I’ll have bigger balls, in each room. 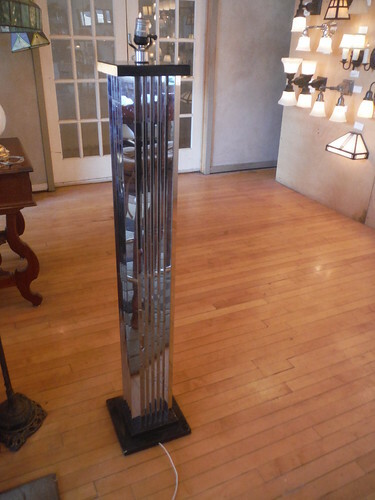 I’ve also commissioned them to renovate a standard lamp (circa 1920s) that mum and dad bought as a housewarming gift when I moved to Seattle in 2000. Charles and Kathryn loved this and told me that if it was being sold today they’d expect about to get about $2,500 for it. WOW, that’s added a couple of zero’s onto what mum and dad paid for it! This scribble was published on Sunday, August 9th, 2015. You can follow any banter on this scribble with the RSS 2.0 feed. You can share your inspired musings after typing the anti spam word near the bottom of the page. But no Pinging because its too naughty. Welcome to the light side! The dark side has all the cookies, but the light side probably has something to compensate, like candy floss (cotton candy for USians). Sounds like a gem of a shop. What a lamp that is of yours!